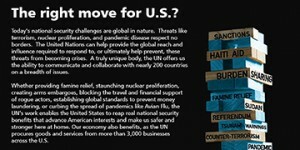 Today’s national security challenges are global in nature. Threats like terrorism, nuclear proliferation, and pandemic disease respect no borders. The United Nations can help provide the global reach and influence required to respond to, or ultimately help prevent, these threats from becoming crises. A truly unique body, the UN offers us the ability to communicate and collaborate with nearly 200 countries on a breadth of issues. Whether providing famine relief, staunching nuclear proliferation, creating arms embargoes, blocking the travel and financial support of rogue actors, establishing global standards to prevent money laundering, or curbing the spread of pandemics like Avian Flu, the UN’s work enables the United States to reap real national security benefits that advance American interests and make us safer and stronger here at home. Our economy also benefits, as the UN procures goods and services from more than 3,000 businesses across the U.S.
No doubt, U.S. contributions to the UN must be judicious and prudent: accountability, transparency, and effectiveness are essential for any organization, including the UN. At the same time, our ability to burden share with other nations helps defray costs, promote stability, and enhance the impact of our resources. Withholding U.S. funding weakens both our influence and support for our national priorities, while strengthening the hands of our adversaries. By actively using all of the real foreign policy, national security and economic tools at our disposal, we help develop the international knowledge, capability and capacity required to help address challenges that, if left to fester, land on our doorstep. We, the undersigned Republicans and Democrats, believe that support of the UN is one of the most cost-effective ways for the U.S. to successfully address global challenges and leverage our global leadership.